'Follow your dream' is the theme of The Wind Rises, the latest, decidedly grownups oriented film by master Hayao Miyazaki. The setting is different too. It's the 1920s-30s Japan: The Great Kanto Earthquakes, The Great Depression, unemployment, poverty and tuberculosis. It's also politically very pointy. From early on, we see a boy's tranquil dreams of flying get overshadowed by ominous war planes adorned with Nazi crosses and Italian flags. There are talks of thought police following engineers. Based on the real life character who ended up designing the Zero fighter plane, the main character Jiro grows up to be an idealistic engineer who dreams of creating a beautiful aeroplane in the midst of national turmoil. But as usual, he is as generous and selfless and heroic as any other Miyazaki protagonists. There is a love story there too, albeit a sad one. Jiro and Nahoko meet during the fateful earthquake and fate would have it, meet up again later on. Nahoko is suffering from tuberculosis and frequents a sanitarium to recuperate. We all know Miyazaki's completely capable of creating exciting battle scenes. It seems he greatly strains himself from portraying any kind of man-made violence in The Wind Rises. 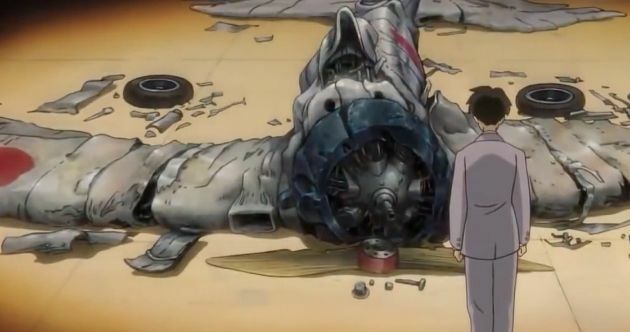 There is a poignant scene where Jiro walks through the graveyard of wrecked planes: the horror of broken dreams. Some of the stylistic choices and especially innovative sound design separates the film from his previous ones too. Mostly the color palette of The Wind Rises is more like sunny impressionist paintings. The title comes from Paul Valéry's poem and characters quote it in French. The complete line is: "The wind is rising...we must attempt to live." The country still reeling from The Great Eastern Japan Earthquake, Miyazaki at once finds parallels in the past and also don't shy away from criticizing Japan's military ambitions. It's definitely the saddest Miyazaki movie I've ever seen. As he announced his retirement, The Wind Rises is a fitting finale of the one whose remarkable carrier not only serves him the title of a master filmmaker, but a true humanist. The Wind Rises plays part of this year's New York Film Festival. Please go to FSLC website for tickets and showtimes.